The collection on display at Low Parks Museum tells the story of the Cameronians, raised in Douglas in 1689 by James, Earl of Angus. With the original recruits being Covenanters this was the only regiment in the British Army with a religious origin. As Scotland's only rifle regiment, it took the decision to disband in 1968 rather than lose its identity by amalgamating with other regiment. From M74 Glasgow/Carlisle exit at Junction 6 Hamilton, Join dual carriageway from Motherwell to Hamilton. Get into right hand lane if possible before traffic light roundabout. Go through first and second lights on roundabout heading for ASDA and Retail Park. Get into middle lane for next roundabout. Continue across roundabout at ASDA/Retail park entrance. Turn right at next Roundabout, Museum is on the corner. Car Park entrance 50yards along Motehill on left. If car park is full, additional parking at Palace Grounds Sports Complex, first on right after roundabout. No Parking at Esport or Hamilton Ice Rink, which are private. Rail to Hamilton Central, which is also the main bus terminal. Cross Bus Station to pedestrian lights by 'astronomical artwork'. 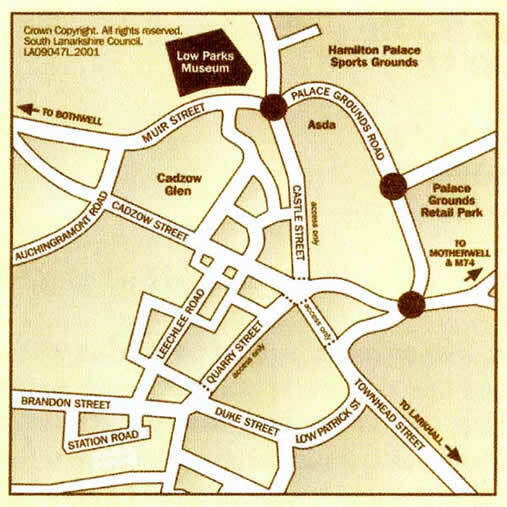 Walk down Leechlee Road, go left at foot along Cadzow Street. Take first right down Church Street and follow down to Muir Street. Cross at pedestrian lights, entrance to Museum to right at corner of Muir Street.